Welcome, welcome to the 5th installment of Blog Banter, the monthly blogging extravaganza headed by bs angel! Blog Banter involves our cozy community of enthusiastic gaming bloggers, a common topic, and a week to post articles pertaining to said topic. The results are quite entertaining and can range from deep insight to ROFLMAO. Any questions about Blog Banter should be directed here. Check out other Blog Banter articles at the bottom of this post! I missed the last Banter, so when bs angel sent out the email for this month's Banter, I immediately set aside some time for it. There was no way I was going to miss two in a row! The topic of this month's banter is how flawed games prevented us from completing them. Interesting. Easy choice. I say so because, if there is one game that I think of when I hear the word flaw, one game which I tried again and again to "get into" and complete, that would be: Pool of Radiance: Ruins of Myth Drannor. It's one major flaw: the interface. Funny in a way, since the topic of our latest Drone Bay podcast was the EVE Online overview and how one could customize it to his or her liking. 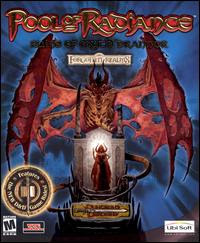 Pool of Radiance was my first PC game. The first I bought myself, the first that I had anticipated, the first I had counted the days before its launch. I even bought a new graphic card for it, because my PC at the time, an IBM PC300, wasn't up to par. I remember loading it and launching the game the first time. The excitement, the trepidation! And then... the disappointment. At first I thought it was me. Somehow I just didn't "get" the menu interface Stormfront had created. When I would approach a monster character and engaged it in combat, I would clumsily fumble trying to cast the right spell, or use the right weapon. Only to realize that I had selected somehow the wrong one. This kept happening over and over. For sure, as time went on, I would become more comfortable with the interface. Unfortunately, this was not the case. Now, I'm not saying that the game wasn't enjoyable; the setting was great, the story was captivating, the graphics (back then) looked great, and eh, this was D&D! But for me, from the moment I started the game, the interface was a flaw I just couldn't get past. No matter how much time I'd spent trying to familiarize myself with it, it just didn't get through my thick skull. So I quit and moved on. My next game was a gift from a friend at work. And what a game it was! Diablo II! Now there was a game with a simple, effective, easy to pick-up interface. That's what all developers should strive for. The interface of a game is something that they just can't get wrong. If they get it right no one notices, but if they get it wrong, they whole game is tainted by it. I don't mind a complex interface, or else I would go nuts playing EVE! But I, for one, am a follower of the "easy to learn, difficult to master" mantra. And that applies beautifully to a game's interface. So how about you? What game(s) have you played and couldn't complete because of a perceived flaw you just couldn't get past? Check out these other Blog Banter articles! Silvercublogger, Unfettered Blather, Triage Effect, Gamer Unit, Delayed Responsibility, Man Bytes Blog, Zath!, Draining Souls.net, Game Couch, 8-Bit Brigade, thoughts and rants, Hawty McBloggy. Episode 8: I smell BACON! Episode 8 is here, and it's time to fry up some eggs, because BACON's on the plate! In the weekly recap, the big news is the Re-Release of BACON. The DON'T PANIC topic for this week is the interface. Learn to set up your overview, and also don't miss Crovan and CK's number one interface tip for surviving in 0.0/lowsec! Mail gets answered, as usual. Keep sending us questions/comments! Also, please review us on iTunes. We're in the "New and Notable" section under Games and Hobbies already. Thanks for the support so far! Also, if you have an idea for a mini-segment (2 minutes or under), then record it as an MP3 and send it to one of the e-mail addresses below. We'd love to get some good listener content! No bloopers, but a fitting out track. Another week gone by, wow! I guess the amazing weather we've been getting here in Eastern Canada has meant that I spent a lot of that past week outside. Guess time flies when its spring and sunny outside. Today though, we've got rain and cooler weather. Perfect for speedlinking, so here goes. New York Comic Con: EVE Online - The Empyrean Age Expansion - And another one! Bacon: Never be surprised again - Or how I like to put it: Never have fun playing EVE again! Some of us became Millionaires - Way to go Ardwulf! The very prolific Jade Constantine has a great piece of EVE fiction on the subject of removing Local Chat from lowsec and 0.0 - smells like a partial solution to Bacon to me. The Bitter Old Noob, Drone Bay co-host Crovan, has got his first Massively.com article published - Congrats Crovan! EVE Evolved: Controversy brewing over removal of shuttles - Brendan discusses the impact of the removal of NPC provided shuttles from the EVE market. The Drone Bay episode #8 is now out! This latest issue is probably the best issue so far. And I'm not saying that because my name (p10) and blog (p77) both appear in this issue. This wouldn't be the first time. My relationship with EON goes back a long time. Some may remember that I had a picture of me and my better-half in issue #003. Once you've stopped starring at Lacy and Melissa, you'll notice me on in the bottom middle photo. Big smile, dark blue shirt next to the cute brunette in a turquoise top (my wife), yep that's me! That was back in 2006 at the Las Vegas Player Gathering. Anyways, back to why I think this is the best issue so far. I say so because of the quality of the articles, news and chronicles. Now I haven't gone through the whole issue, but with what I read so far, I really look forward to the next issues. In our digital day and age, where important gaming events come-up weekly, if not daily, EON still manages to get me excited about upcoming events (Fan Fest 2008), guides (Insider's Guide series) and upcoming products (EVE novel, EON Special Issue). And before I forget, anyone who's ever read an issue of EON, please take the time to complete the EON Survey that Zapatero has put up. It's time well invested in the future of this precious publication. 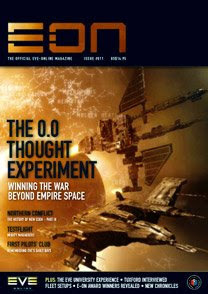 As always, this latest issue is a must for dedicated EVE players. I strongly suggest that you order it or better yet, subscribe! Well, to say that the past week has been very busy would be an understatement. With the Source Code leak and other news items, today's speedlink list is extensive. Enjoy! Everyone and their mother started reporting the "leak", including Massively. Then they all started downplaying the incident (MMORPG.com, gamesindustry.biz, WarCry, WorldsinMotion.biz, NextGeneration, Kotaku and Massively) after CCP's response came out. Some commented on CCP's response, while bloggers discussed the issue and other idiots proudly boasted about the leak. Yeah, idiots. In the end, it wasn't all the fuss it was supposed to be. And it's now, just a few links. Enough said. Five Years and Counting, Interview with Valerie Massey - Factional Warfare anyone! EVE Online Trinity Ship Gallery - All your ships on full display. EVE Guides - Looking for something? They can probably help! EVE-Central: EVE-Online Market Aggregator and Trade Finder - That says it all. Everyone vs Everyone Online: The End is Nigh - Ben over at Massively does a nice recap of the Band of Brothers (BoB) and Goonfleet war situation. CCP Greyscale teases us with a post on some upcoming goodies - A guess anyone? Mining Buddy - If your corp mates are boring, or no help at all! Oh, and lest I forget, I made important updates to the EVE Online Player Blogroll, adding a good chunk of great blogs! Finally, CCP gave us an update on the CSM candidates selection process and provided us with the list and information on all 64 of them! Till next time, fly safely! During the past week my corporation, Phoenix Labs, has had a few mining operations in which I participated as the hauler, moving the mined ore from the belts to the nearest station, where it was processed. In this screenshot we can see the Gallente Iteron Mark IV (or III?) that I used to move the precious ore around. I've been warping in EVE Online for almost 4 years now, and even after all this time, I find myself mesmerized by the beautiful backdrops. I can't wait for the Trinity update that will see belts, planets, moons and other elements upgraded to the current graphic engine. Episode 7 is upon thee! Cower in fear! Also, little to no WoW talk this week, we promise. In the weekly recap, Crovan edits out a sneeze, but forgets to edit the part where he warns that he's going to sneeze. Also, EVE's source code gets out, and is posted with a chatlog. Drone Bay says Just Say No to source! Also, CCP hires garbage men in Trinity 2.3. The DON'T PANIC topic for this week is the market. Be a day-trader! Watch out for market bubbles! In the listener feedback section, the guys discover that their Skype voicemail works! Yay! Please get in touch with us. We want to hear your dulcet tones. Also, discussion ensues about how hard EVE pwns WoW vis-a-vis PvP. A new segment, titled "Tool Time" debuts this week. The first tool featured is EVEMon. If you aren't using EVEMon, you are wrong! More mail this week, which was good. This week, though we are now welcoming/inviting you to share your own expertise with mini-segments! If you want to record something that is under 2 minutes long in mp3 format, has good audio quality, and is something you think we would find to be quality work, send it on! I recommend using Audacity to record/encode the mp3, since it's free and rather easy to use. You will need to download a file library to encode mp3s, but all the links are on the Audacity site. In a pinch, you can send us a wav file. No bloopers this week. Not because they didn't happen, but more because Crovan left them in in order to simulate "live conditions". We are still contemplating taking the show live in the future, at least for the recording process. This is a taste of the insanity likely to ensue. Enjoy! For those of you who visit the blog and don't just read them through RSS readers, you'll have noticed that I gone from a 3-column back to a 2-column design. I did this because as I sat down yesterday morning for my usual week-end clean-up, I kind of noticed that with the 3 columns it was getting visually very crowed. Now what I like about the 3 column was the fact that the blog page wasn't too long, since I had widgets on both sides, cutting in half the length of the page. The down side was that it was too busy - for my taste anyways. This is where you come in. I need your opinion. I've set-up a poll on the top right column and would like to know where you stand on this matter. If you want to let me know, please fill in the poll and add your comments to his post. I'll make sure to take into account every opinion. I thought I'd also add the blogs of fellow EVE players as a searchable post. It'll be easier for them to show up in searches. If you know, or have, an EVE Online blog and keep it updated regularly, then please let me know and I'll add to this post and the blogroll. CrazyKinux's Musing <== THIS BE MINE!! Podded: The EVE Online podcast for you! September 5th, 2009: Removed all Gamescribe blogs since its shutdown. September 26th, 2009: Added a bunch of new blogs! October 8th, 2009: Major overhaul of the two lists, which I've merged back into one master list (Podlogs blogs and the rest of the EVE Blogs). I'll be adding more blogs soon and tweaking the existing list! November 4th, 2009: Added a few new blogs, removed some duplicates and updated the URLs of a few. December 6th, 2009: Added a bunch of new blogs! Welcome to the family guys! March 18th, 2010: Added 22 new blogs! March 19th, 2010: Added 12 more! March 21st, 2010: Added the last 17 missing blogs! March 31st, 2010: Added 7 new blogs. June 22nd, 2010: Added 33 new blogs. OMG! July 2nd, 2010: 9 new blogs added. September 3rd, 2010: Removed outdated blogs and added new ones. September 9th, 2010: More blogs added! September 23rd, 2010: Added new blogs! November 11th, 2010: Removed over a 100 dead blogs. November 12th, 2010: Added 17 new blogs. November 27th, 2010: Added 4 new blogs! December 22nd, 2010: Added Brutor Bullfighter. February 14, 2011: Added a bunch of new blogs! EVE Strategic Maps will ship late, and that makes me happy! Why you may wonder? A worthy questions which deserve an explanation. 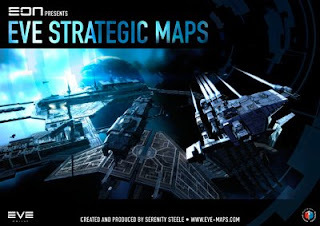 Last week, while waiting for EON issue #011 to arrive, I ordered Serenity Steele's EVE Strategic Maps. I hadn't planned to order it so soon, but when I got the MMM Publishing newsletter, I just couldn't resist. Since then I did receive my EON issue (and will be posting the ToC soon), but I was still waiting for my ESM. shipping within the next 10 days. However, we have just returned from CCP’s Iceland HQ where we discussed some exciting new content which will slightly delay the shipping of EVE Strategic Maps, but will in fact put you well ahead of the rest of the player base. Why? There is, as you may know already, an expansion coming in a few months, which will introduce completely new content to the world of EVE. So although your copy of ESM will arrive a couple of weeks later than planned, it will now contain advance information, allowing you totake advantage of the knowledge of this new content before anyone else. CCP has agreed to exclusively reveal this data to us now, wellin advance of it ‘going live’, in order that we can ensure the first run of EVE Strategic Maps includes the most accurate information possible. As you read this, Serenity Steele is busy exploring this new contentin his Polaris Frigate, plotting the data and mapping every system,planet, moon, asteroid field, ice field and jump gate. With EVE Strategic Maps on your desk, you can be ready to take control. We will email you again to let you know when your copy of ESM is on the way, but for now thanks for your patience. We promise you will not be is appointed. Priviliged information eh! Well I can certainly wait a bit longer for that! If you haven't ordered your copy, now's a great reason to do so. Or else you can wait for my review once I receive my copy. I thought I'd give you the Top 10 list of posts (or pages) for CrazyKinux's Musing - that is the posts or pages with the most visits. Though it may change in the future, the top ten posts have been pretty stable over the last few months, with very little change in the order. What's the longest you've gone without playing? An EVE Online poll. So, is your favourite in there? What is you favourite post? What do you think I should write more about. Less about. This site is as much for you, as it is for me. So I'd very much appreciate you comments and feedback. All kidding aside, here is a picture of my daughter with her EVE Noob bodysuit, which I purchased a few weeks ago. I had promised you a picture way back then, and there she is. Ain't she the cutest! Now if you'll excuse, I have to go change, now that she's spilled the beer I was drinking in the EVE mug I also got back then. I've done it! I've actually stepped into the land of Azeroth and rolled up Tarakk, a Tauren 7th level Warrior. I've only got 10 days to enjoy and play with my fellow podcaster in crime. Yep, they're the ones responsible for getting me into this mess, errr I mean new MMO. In the mean time, enjoy these EVE links, while I get this standing fat cow, oops, I meant to say Tauren, to go kill some more puppies, birdies and other weird beasties! The Presentation of Candidates... - Van Hemlock on the CSM election. Tip of the hat for GFW - Games for Windows switches to digital format only. The Profusion of Interdiction - Where Wilhelm sees Interdictors everywhere! Halada's "The Complete Miner's Guide v2.2" - If mining is your thing! Eden Explored - An in character diary of an EVE explorer. Very well done! What do space jockeys do for fun? - A noob's take on EVE. Warp Drive Active #154 - The ultimate link bait! EVE Online Pirates - As if we needed more of these guys around! The Drone Bay #6 - In case you missed it! Came across this really cool video entitled "Drake. Designed to change your life". It was posted today on Daily Motion by EVEAnon26. I don't know if the video is from him, but it's really cool to see EVE ships this way. If you know more about the video, I'd love to know about. Since my return to the Khanid Kingdom, I've been running missions and mining for the corp. This screenshot was taken while docking at an Royal Kahnid Nay (RKN) station while doing the "Pirate Intrusion" mission given to me by agent Umid Ashain. I'll have more screenshots of this particular mission soon. Just so you know, that little dot on the top right corner is my Vexor on its way to the station docks! Fly safely in the mean time! Actually it's been in the works for a while now. This is something that I kind of had on my wish list and which I was looking forward to. Now it seems that with the latest version (3.1.3) it will run on handsets, as long as your device needs to support MIDP 2.0 and CLDC 1.1. The gentlman behind this effort is Jaabaa, who posted about it on the EVE Forum wayback in June 2007, and who's latest update (see the edit note) is earlier this March. The video below, though dated back to July of 2007, still gives us a good idea of what this mobile application looks like. So it's not the full EVE Mobile edition, and you can't actually change or set skill training. But we're getting closer people. I guess you could call it EveMon Mobile Edition! If anyone from CCP is reading this, please, oh please make this application official and allow us to change our skills in training. Once we've got the door open for skills, then we can add other mobile features (access to station facilities, chatting, monitor markets, escrows, etc. - hell, even voice chat now that EVE Voice is out; ok that may be pushing it!). If anyone knows about a more recent video, please let us know. For those that have handsets that comply to the spec requests, here's where you can download the application. Earlier this week I was flying to a new system in Khanid space and came in to a station from a point of view which reminded me of the Homeworld mothership. As you may recall, I'm currently playing (or trying to at least) Homeworld 2. So the image of the Kushan Mothership was fresh in my mind when I came across this Amarr space station. It's as if they were separated at birth! The Drone Bay: Episode 6 - Yes, I Assure You We're an EVE Podcast! Yes, I Assure You We're an EVE Podcast! In the weekly recap, Al and Crovan giggle at their own hilarious with regarding the April Fool's episode, and share the woes of everyone's limited playtime. CK shares a great resource for the upcoming CSM elections. The DON'T PANIC topic for this week is mining. Crovan is allergic to Veldspar, so CK steps up as the mining sensei. In the listener feedback section, a question is answered, the guys answer one piece of criticism, and Al and Crovan once again giggle about last week's show. Al is sorry. Crovan is not. This week's out of game discussion is about...another MMO that Crovan refuses to name in the show notes for fear of mail bombs. Keep sending us your mail! We love it! We need it! Stroke our egos! Flame us! We don't care, just send us more mail, or I'll put more exclamation points in next week's show notes!!!! This week's music bed is "Forever Lost" by AlienHand. Go to the link to check out his other great stuff! The guys had a pretty tight recording this week, so no blooper reel. Instead, please enjoy a really funny machinima version of re: Your Brains by Jonathan Coulton. 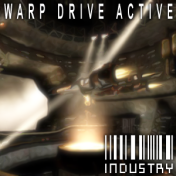 The Warp Drive Active: Industry podcast has finally nudge itself a spot within the VirginWorlds Podcast collective. Though Benilopax and Lavista Vista have got a few shows under their belts, it took a while before the show got its spot. Whatever the reason, they're now here and you should definitely add them to your list of regurlar EVE podcast - along with Warp Drive Active (The Original) and of course The Drone Bay. Shows #1, #2 and #3 are now available for download. And please take the time to let them know what you think of the show. The Drone Bay Episode #5 - The guys pull one off without me and catch of few fishes! Eve Online Creator Reynir Harðarson - World of Darkness fans, rejoice! The CSM Candidate Infozone - Blinky brilliantly puts together a list, all by himself! Mammoth Explosion - When Wilhelm loses, he loses big! Looks like fellow capsuleer swp(ws) is putting together an EVE Online movie - "Curatores Veritatis Alliance The Amarr Empire". And from the looks of the trailer he's just released, we're going to be impressed. Once you've seen the trailer below, head over to the EVE Forum thread and let him know what you think! Now that BSG is finally back on the air, you may have wondered where the frak we had left off. You're not alone. I found this great little video over at Voodoo Extreme that recaps the last 3 seasons and gets you up to speed for tonight's episode. You can even download the piece. Very well done! The Drone Bay: Episode 5 - The April Fool's episode! We're a bit short on show notes this week. Suffice to say that there are big changes coming for The Drone Bay, and we hope you'll stick it out with us. CK was unable to join us, but Al and I soldiered on without him again. Look to see him back next week as we continue with our new format. Until next time, lvl 22 war LFG for SFK. 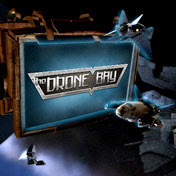 As always, you can e-mail us at dronebay[at]gmail.com. The new format may require a new e-mail address, so be on the lookout for that.